Baptised privately 7 Feb. 1902, public church reception 8 March 1902. Sponsors were Herbert VIZARD, Charles E. WILKINSON and Mrs E. J. GALLOP. 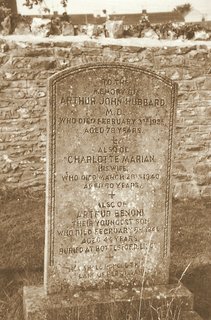 Died Friday 8 February 1946, Ashby, Scunthorpe, Lincs. Buried Bottesford, nr. Scunthorpe, Lincs. The service was taken by his brother, The Rev. George Edward HUBBARD.